Broadband For Students Can Improve Student Education! What's so important about broadband for students? Think about the vast amount of information and knowledge that can be found on the Internet. Sure, the world wide web is full of useless, and even inaccurate information, questionable social media, and even inappropriate and destructive content. HOWEVER, once you filter through all of that crap, the knowledge of virtually the entire planet can be found with the click of a mouse or the touch of a screen in a fraction of second. Previous generations would spend hours and even days or weeks researching a given topic. Now we can learn about anything imaginable at will. The required skill has shifted from learning how to use legacy search tools (and often finding a lack of available information), to learning how to decipher the real, true, and valuable information that can feed our knowledge and shape our intelligence. The critical challenge, however, is providing access to broadband for students who are in the prime of their learning. The number of students nationwide who don't have Internet access at home is said to be over 10 million! These are obviously people who are struggling financially, and can't afford what is considered an elective benefit such as the Internet. Lack of access, however, has been shown to affect student's grades, and graduation rates. This is referred to as the "Digital Divide", and is truly much more than an optional nice-to-have technology. It is critical to shaping the minds of young students! It seems inevitable that in the future broadband access both at home and school will be built into city infrastructure, and available to everyone regardless of socioeconomic status. Until then, however, there are dedicated volunteers and PTAs who work hard to raise money to help provide access to devices and broadband for students. What I want to highlight here is that there are also wireless companies dedicating resources to address this growing digital divide. In fact, there's one specific prepaid wireless provider, Kajeet, that has an entire initiative around Education Broadband. They provide hotspot broadband modems (Kajeet SmartSpot and SmartBus), and a cloud based management portal tool to provide disadvantaged students access to the Internet outside of school. The cloud portal allows school districts to provide CIPA-compliant, education-only, filtered Internet access. This ensures that students are appropriately focused on homework, rather than distracted by social media, and the darker parts of the Internet. Furthermore, these tools provide parents with the peace of mind that websites are being intelligently filtered so they are not distracted from non-educational content. It also provides time parameters within which students can get access. The tool also has reports with learning and usage analytics. Kajeet also supports Google SafeSearch and YouTube Restricted Mode (to block adult content). Given that two-thirds of all data traffic comes from Facebook, YouTube, Netflix, Instagram, and Snapchat, Kajeet's tools help school districts keep data costs down by avoiding these services that also tend to distract students from their work. Of course these tools have merits in their own right, however, to meet the objectives of Kajeet's Education Broadband, these sites are blocked. The Wheels On The Bus...! Kajeet Choice - District manages the entire program through the cloud-based tool. Kajeet Managed - Kajeet assigns an Education Program Manager to manage the entire program. 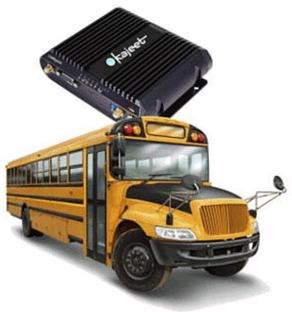 Kajeet SmartBus - Broadband on the bus! Important: Please note that this website is not affiliated with Kajeet. i.e. I don't receive any payment or sponsorship for describing their service. I've been following Kajeet's cell phones for kids for years, and when I discovered their broadband for students initiative, I was very impressed, and simply want to share this fantastic opportunity with others! Check out more details at Kajeet Education Broadband.